1. The competition is open to participants from all regions, except close relatives and anyone otherwise connected with the organisation or judging of the competition. 4. Only one picture entry will be accepted per person. Multiple entries from the same person will be disqualified. 5. Closing date for entry will be November 1st 00:01 CEST. After this date the no further entries to the competition will be permitted. 7. Cooler Master, Patriot Viper and Kinguin will judge the competition and validate the selected winner, which will be picked at random from all complete entries. 8. Cooler Master‘s decision as to those able to take part and selection of winners is final. No correspondence relating to the competition will be entered into. 9. 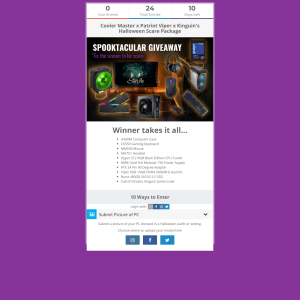 Cooler Master, Patriot Viper and Kinguin shall have the right, at its sole discretion and at any time, to change or modify these terms and conditions, such change shall be effective immediately upon posting to this webpage. 10. Cooler Master, Patriot Viper and Kinguin also reserves the right to cancel the competition if circumstances arise outside of its control. 13. Winners will be chosen at random by software, from all entries received.